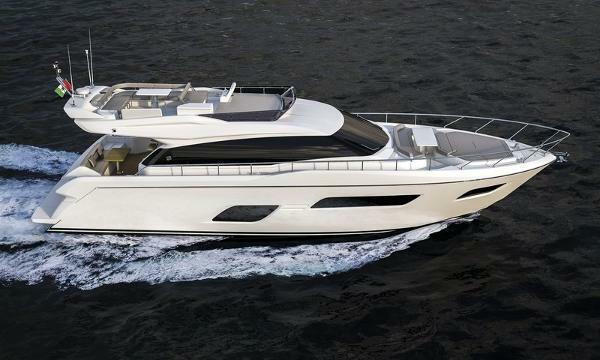 The new baby of the Ferretti range is sure to be a classy contender with its well lit interiors with natural light, flush portholes and spacious saloon with double facing lounge area. The two options of cabin layout with a full beam cabin and three heads is sure to draw attention. The flybridge has a sporty look with more seating with C shaped sofa and accessible wet bar. The bow has the standard sunpad with an additional new exiting bow dinette to give another place for relaxing and entertaining. With various new exiting features with completely new design for hull and superstructure the Ferretti 550 is paving its way to super success like its predecessor. The new stern design with integrated tenderlift and concealed gangway offers a new sporty look to the yacht. The Ferretti 550 earlier model was the first Ferretti yacht to come to Mumbai, India with Marine Solutions in 2007.